Secret Weapon Miniatures recently released some new display plinths, or cubes as SWM calls them, to their range of products. In lieu of those releases, they sent out some samples for review. Keep in mind that I”m not a display painter, and so this is my first time handling any “professional” display plinth. The display cubes they sent were from the “town square” line of products, and each shows bricks, cobblestone, or other typical fantasy or steampunk street. Below you can see how each one is packaged – in a bag with a product identification placard stapled to hold the bag shut. Above, you can see six cubes, one 50mm, two 40mm, and three 30mm cubes. These items are not currently listed in the Secret Weapon store by specific names, however, doing a simple search for “display” or “display cube” on their site will yield what I’d call a good approximation of cost o . The 50mm display cube in the shop says cost is $10, while the 40mm cube retails at $8, both in U.S. dollars. A search on the internet found me a 25mm wooden cube for $12, and a 35x35mm for 5 British pounds. It seems the prices can be all over the place, depending on size, height, and detail sculpted on. 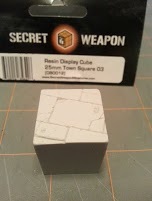 The Secret Weapon shop only shows the plain cubes without design. I imagine the price for these will rise three or four more dollars, respectively, for the detailing on them. 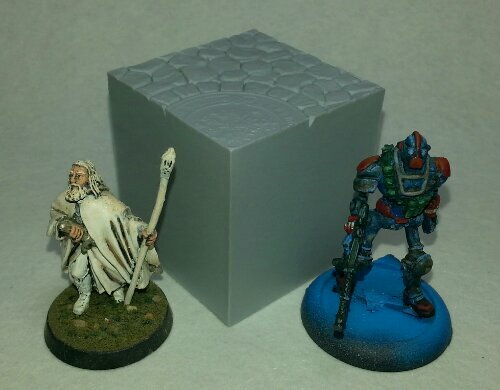 To see how big the footprint of the bases were for actual models, I grabbed two models- a 25mm based Games Workshop Lord of the Rings Gandalf the White and a 30mm AE-WWII Robot Trooper by Blackball Games. As you can see, the 25mm base fits nicely on the 50mm cube, and would make a great display piece without the base attached to the figure. Next, I placed both models next to the base for a height comparison. Both models are considered 28mm, so the 50mm base is easily taller than the models themselves. As the display size decreases, the available space to put the model does to. At 40mm, there is still plenty of room to place your figure. 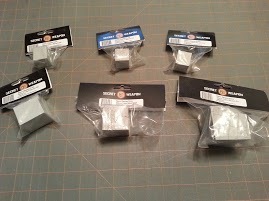 The 40mm cube is just taller than Gandalf, and right at the Robot Trooper’s head, so roughly 30mm. The bases are square, so each plinth measures exactly as described- 40x40x40mm, 50x50x50mm, and 30mm. The detail on the cubes is nice, and the specific lines in the sewer lids are without error. The cracks and spacing between the rocks and stones on the bases is deep, allowing some good inks or washes to flow into the. Because of this, I would imagine painting them would be quite easy, allowing some great paintwork on them. Comparison Shot with 25mm and 30mm models. Back Center, 50mm, back left and back right, 40mm, and front row 25mm cubes. Above, I took a final picture to display the entire set, with Gandalf and Robot Trooper for size comparisons. The cubes are pressure cast polyurethane resin as described by Secret Weapon, and should be washed before priming and painting them. All in all, the good thing about these bases is that they come prepared and ready for you to paint up and put your miniature on them. Since there are three different sizes, it shouldn’t be hard to find the right fit for your model, unless you’ve got something bigger than these can hold. Personally, I like the design of the cubes, as I couldn’t duplicate them in near detail as Secret Weapon did. If you used all of them, the Town Square series themes well together, and several models lined up in a display cabinet on these would look nice- as if they are marching down the same town street. Maybe the rough side of town has cobble stone, while the richer, more glamorous side of town has cut stone for the streets. The one thing that I dislike about the set is that your limited to what you see here. They aren’t unique, and city streets have been before by other companies and by modelers in the past. However, for someone like me who doesn’t paint for competition and would just like to use something to display my model on, they work great. Since the designs aren’t very unique, but do hold well cast designs, and are to exact measurements, I’d give the items an overall thumbs up. I would rate them more usable if there were more in the product line or if they came with additional add-on products to make the cube unique and different. 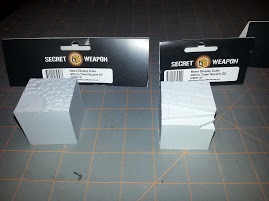 All in all, if you haven’t, check out Secret Weapon Miniatures for one of their many different products. There is a lot out there for the painter and modeler. This entry was posted in Companies, Previews, Secret Weapon Miniatures and tagged blacball games, reviews, Secret Weapon Miniatures by varagon. Bookmark the permalink.